IT plays an important role for university activities. To be better performance for protected IT services, Information Infrastructure Initiative (i-Cube, for short) constructs the campus authentication platform, and have been issued "SSO-KID" to every university staffs and faculties since 2007. The i-Cube has been integrating user authentication of protected information services into SSO-KID based authentication system. Integrated authentication platform may realize easy, trustworthy, and secure protected services. 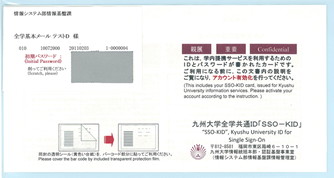 SSO-KID is acronyms of "Single Sign-On Kyushu university ID". SSO is a property of access control of multiple, related, but independent software systems. A user logs in once and gains access to all systems without being prompted to login. Confirm your SSO-KID (for student)Confirm with your student ID card. Confirm your SSO-KID (for faculty and staff)Confirm with your SSO-KIDcard. Password ResetReset the password yourself. You have two IDs. Common ID (SSO-KID) and Student ID. Prepare your Student ID Card, and check below. Your Common ID is printed at the reverse side of your student ID card. 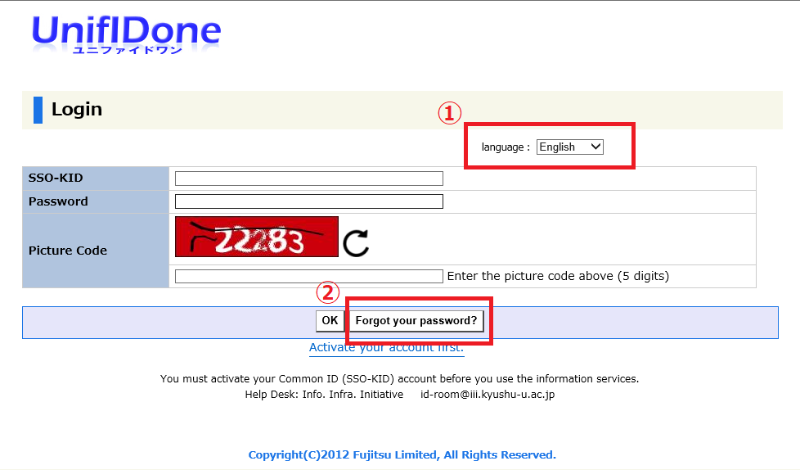 Please confirm the surface of the IC student ID card. Your registration code is printed right side of your Student ID Number. You should activate your ID using this registration code first. Besides, if you forgot the password, you can reset it by yourself using this code. SSO-KID and registration code will be announced at the student office which you belong. 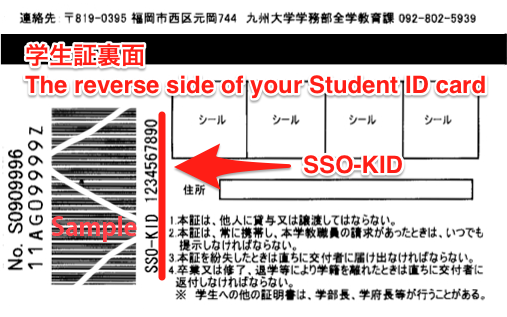 The common ID at Kyushu University is called "SSO-KID". When you come to Kyushu University as an employee, we send to you via personnel section of your department. We deliver your SSO-KID card to your personnel section. If the card has not arrived it yet, ask them first. If you could never find it, you need to submit the reissue application form. Fill it out and bring it to your personnel section. Open the envelope, and confirm the entries on this card. If you found mistake there, please ask to amend it to your personnel section. The barcode can be utilized at the Kyushu University Library. Please cover it using a laminate seal, which is included with this card. A Registration Code (It was called "Initial Password" on the old system) is covered with scratch-off. Scrape away the seal using a coin, and you will be able to confirm your registration code. If this seal has already scraped away before you received it, please contact us. Before you use authentication system for the first time, you should activate your SSO-KID. The languages which can be used in this system are Japanese and English. 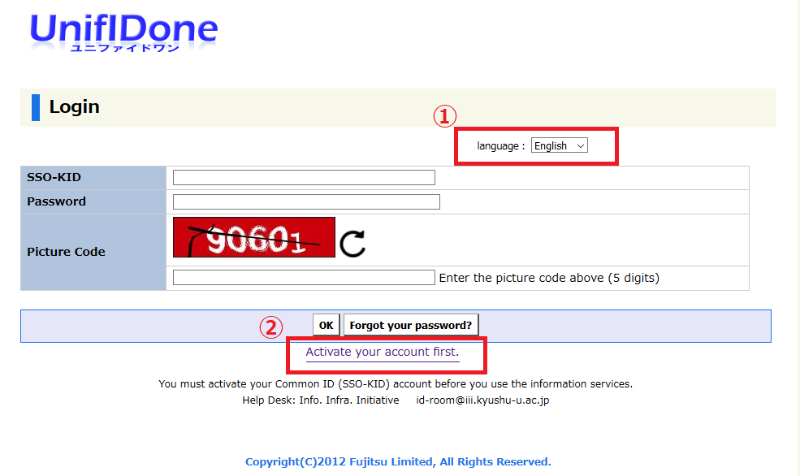 If the OS or browser in your PC is used other languages, you should choose "English" at the following URL. 1. Access password change site. 3.Click "Activate your account first"
4. Enter SSO-KID, registration code, and your birthday. 5. After that, enter your new password. Never activate until you have entered your new password. You must keep your SSO-KID and password safe. You can change your password on the following page. You must keep safety your SSO-KID and password. If the OS or browser in your PC is used other languages, you should choose "English" at the above URL. Your password must include a combination of non-alphanumeric symbols, numbers, and letters (upper and lower case). Can't use Yen-sign(\), back-slush (／), space( ), and double-quote("). If you are registering as a reminder you can reset your password yourself. 3. Click "Forget your password? ". 4. Enter SSO-KID,registration code,your birthday and picture code. 5. The procedure depends on the setting of the reminder. Confirm the e-mail address of the resetting code sender and click “Get Reconfiguration Code”. Enter the reset code written in the mail. Answer the two questions you registered. 6. Set a new password. i-Cube provides Matrix Password Authentication system (QMAX) for secure serivces. QMAX is a reverse web proxy type SSO system. If you have IC staff card, you can access following sercies via QMAX.